Nothing goes down your throat with such a quenching and refreshing feeling than a cold drink in the summer heat or a hot afternoon in the tropics. However, there are no shortcuts with the standard ice cubes, as you have to chew down on them or have them whole in your mouth, which can be quite unsatisfying to many due to the overwhelming biting effect of the cold ice or those sensitive teeth. Nevertheless, do not let this get in your way with the best snow cone machines available. With a snow cone machine, you can get your cold refreshing drink fixed in liquid ice form that is easy on you and teeth too. With ground ice too, you can virtually prepare any cocktail mix you can think of. If you dare to try, the options with snow cone machines are endless. WHAT IS A SNOW CONE? 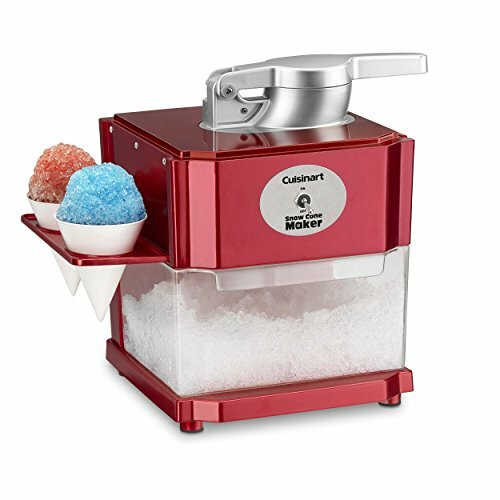 A snow cone machine grinds up ice cubes to produce smaller pieces of crumbly ice to the taste while eaten or feel when touched. The snow granules have a tendency to lump together and re specifically used to fix snow cones or slushy drinks of different flavors and colors. Under the summer overhead sun, our bodies can barely handle the heat. A cold beverage goes a long way in keeping our bodies refreshed. Moreover, what is the best way to have something cold than in the form of a snow cone? With some affordable and available ingredients such, as flavored and colored syrup with some ice from the fridge, you can have your cold refreshment ready to go. 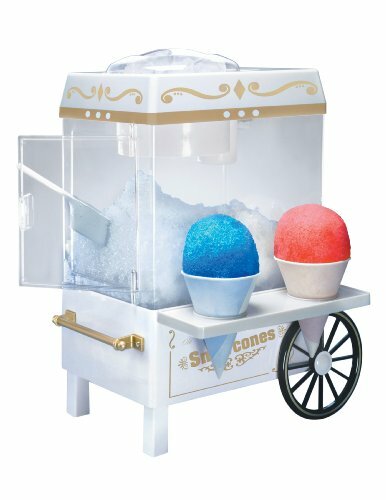 The Nostalgia SCM502 snow cone maker comes in an interesting vintage design that looks like a mini cart, which allows it to stand conveniently on the countertop in your kitchen decor. It has a side shelf that can hold up two snow scones for safekeeping instead of finding alternatives holding options while serving. Despite its size, it is capable of producing up to twenty snow cones in one go. With such a volume, it comfortably serves a medium party with no down times. The machine also comes with accessories that include an ice scoop, reusable snow cups, and straws for use. It also features a stainless steel blade that increases the durability of the machine compared to the plastic blade machines. It also has safety features included such as the safety switch that requires one to replace the ice compartment lid for it to switch on. 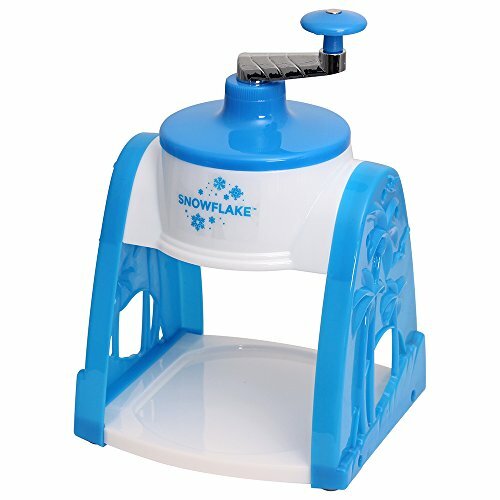 The Little Snowie 2 Ice Shaver features a patented designed that is engineered to give the best of the snow cone machines available in the market. It comes in a compact design that is both space-saving and functional too. It can conveniently fit in the small counter spaces at home or in the office. 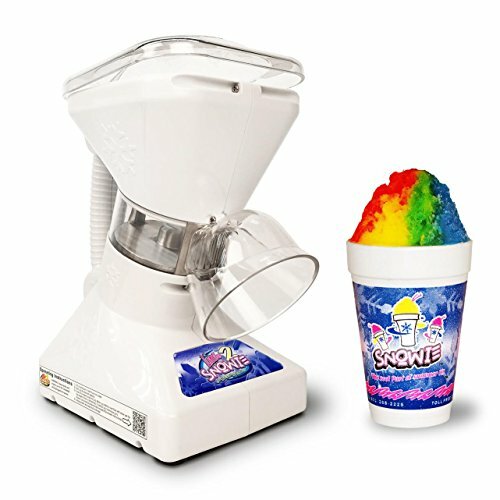 It is also the fastest snow cone machine that can grind ices cubes directly from the freezer loaded in the hopper full to the brim in a mere three seconds. It never gets this fast with any other machine. It also comes with shovel spoons and eight reusable party cups that you can use from time to time. Upon buying, it also comes with different sample colored and flavored syrups that can be bought once finished. 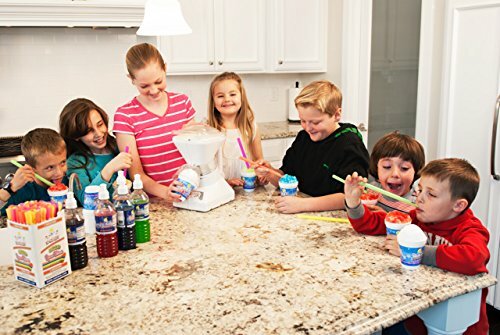 The snow cone machine comes in a compact design too conveniently to fit in a small and cluttered kitchen counter. 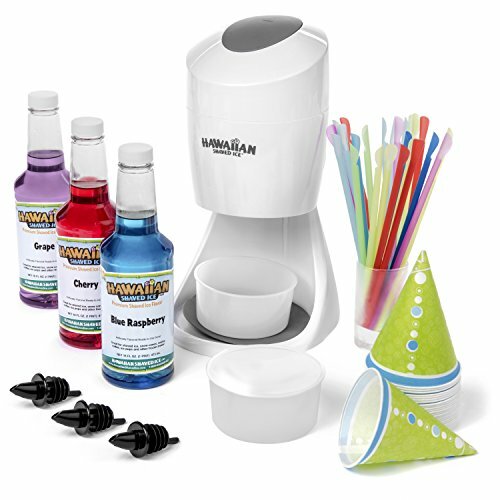 It comes with accessories such as 25 non-leak cone cups, 25 spoon straws, three syrup flavors, and three bottle pours that can be fitted in any bottle while serving the syrups flavors .it also has a spring coiled separate cone holder. It features an easy to load hopper that comes with a safety switch that only works when you pressing down the ice in the hopper. It also has a reliable electric motor that can work long hours without stoppage times. Compact design that can conveniently fit in small space within your kitchen counter and blend in with the kitchen decor. 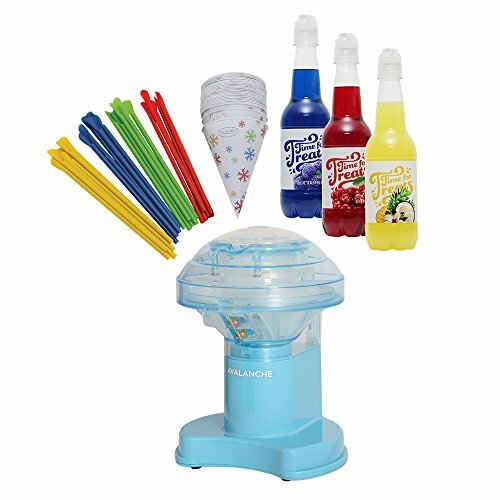 The manually operated snow cone machine features a simple design that blends in the kitchen counter décor. Despite its simplicity, its functionality is on point. It can quickly grind down an ice block in a matter of minutes, thanks to its stainless steel blade that is securely bolted in the inside on the hopper. It is also quick and easy to clean up, unlike the motor driven machines, as it can be dish washed. You do not have to worry about the electrical parts. It also has a safety system that protects the blade from exposure once the lid is removed. It also has a drip tray placed on the bottom to catch on dripping water thus prevent the mess as no water spills over to the countertop during use. It comes in a rectangular shape that is space conscious when placed on the counter. It also features a powerful motor and professional grade blade that can grind up to five cones in barely a minute. It has a sizeable hopper on the top that can comfortably handle regular ice cubes from the freezer. It is constructed from a food grade plastic free of BPA that is also durable compared to other plastic machines. It also comes with double fold-down cone holders that makes it easy in holding on snow cones while adding the syrup. It also has a pull-out storage compartment at the bottom that holds ground ice cubes ready for serving. The serving tray features an interlocking safety feature that requires one to switch off the machine to remove it to avoid any injury by the rotating blades. Another safety feature is the on/off on switch that requires one to close the lid to start shaving ice. It also comes with some accessories such as 12 paper cones and 4 BPA reusable plastic cones for use. The machine is entirely made of Stainless Steel Construction from the top hopper to the stable base that comes with a smooth and subtle chrome finish that can blend right in into most kitchen counters. The stainless steel construction improves on the durability of the machine too. It features a safe operation protocol that has the switch shielded away from hands reach. It is both waterproof and the machine motor only runs when the lid has been closed. 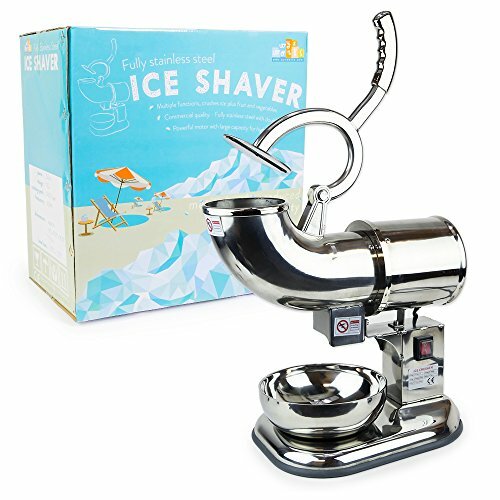 It also features a simple operating system that only requires you to add ice to the hopper and push the handle to shave the ice. None of the complicated buttons or procedures. It has a highly efficient motor that works hard enough to produce up to 440 lbs of ground ice per hour. It also has dual steel blades that easily eat through the chunks of ice with ease. It can comfortably be used both for household and commercial purposes. The latest models are also capable of grinding more than just the ice. They can be used to chop fruits and veggies for salad too. It also comes with an extra set of replacement blades in case the current ones in use are blunt or worn out. A small compact machine that is manually operated with a crank on the top. It makes it portable and saves space on the kitchen counter. It also features adjustable shaving blades that give the user the freedom to determine the size of the ground ice. It also comes with stackable molds that can but used to make ice and collect ground ice on the bottom of the machine. The ability to stack on top of each other also saves on space. It can also be used with ice cubes from the freezer making it versatile to any form once you can use. The machine incorporates a creative design constructed by a stainless steel that improves on durability and resistant against rust. The sleek and elegant design sits well with virtually any decor from the house to the office or commercial space. It also offers versatility as it can be used to make snow cones as well as frozen drinks at home or in commercial places such as the restaurants, bars or carnivals. It also made food-grade stainless steel blade and casing with a plastic base material thus makes it safe for human use. The stable base gives fortified support that reduces vibrations as it works. It features a safety switch that guarantees safety during operation to avoid any injury. It only switches on when the ice hopper lid has been closed and is pressed down. It has a fast and efficient motor that can grind ice at an impressive speed of 143 lbs per hour. At such a speed, it can comfortably fit in a home also in a commercial space. It also features an ergonomically design that allows for easy and comfortable operation. This makes it convenient and time-saving, as you do not have to keep resting after a short while. 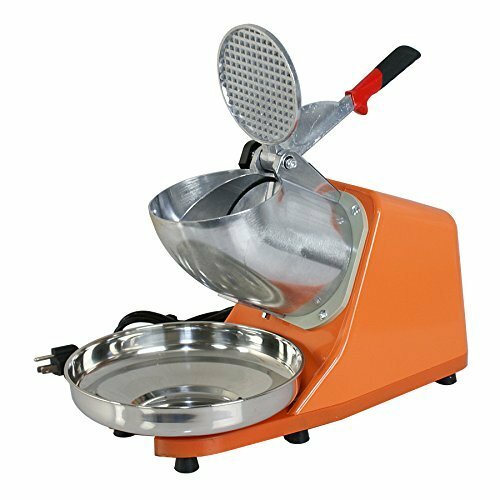 Features a great design and is constructed out of the high-quality aluminum rotary grinding wheel and its casing is made of plastic. Its blade is made of stainless steel that improves on durability. The machine is also rust proof. Its compact design rectangular design also comes in handy in small kitchen spaces as it occupies less space during storage. It is also easy to operate, as it is ergonomically designed makes it comfortable to use for lengthy periods. It also has a safety switch that turns the machine on once it has been replaced in the shaving compartment for safety purposes. It also has a knob under which you can adjust the size of ground ice to suit your preferences at the moment of need. It also comes with a strong motor that efficiently chunks through the ice with ease to make 264 lbs of shaved ice. It can be used both at home and in a commercial space such as a restaurant or bar. Made out of food grade plastic, it weighs less than most of the aluminum and stainless steel counterparts. This makes it lightweight thus portable. It also features a great design that is both functional and space saving. It can comfortably sit on the kitchen counter or in the cabinets and with more space to spare. It has a stainless steel blade used to shave and grind ice thus improving on its durability. It also has a safety feature, a constriction on the top of the hopper that cannot fit a hand, which keeps the hands or fingers out to avoid being injured. The on button is conveniently placed on top of the cap that also acts as a safety feature that only switches on the machine if only the lid is closed. The blades can also be adjusted to give out different sized ground ice depending on the need. Often people have the tendency to use the terms snow cone machines and shaved ice machines interchangeably. However, this should not be the case as each is unique. The machine uses blades to crush ice cubes into small particles that are crunchy to the mouth whereas a shaved ice machine grinds up ice cubes to make soft and fluffy ice. They are both used to fix cold refreshments during the warm seasons. Both machines employ a similar production process, however, there is a major difference, and that is the texture of the final crushed ice. 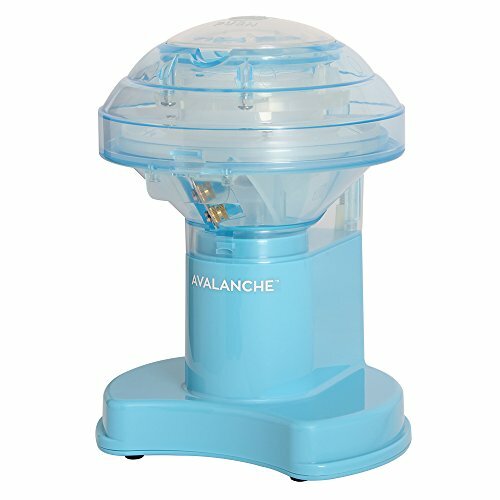 The snow cone machine gives bigger snow aggregates that are rough to the touch while the shaved ice produces a soft ice that is fleecy to the touch. Another difference is on how the product is served. The snow cone is served on paper cones as it more granulated and can stick to each other forming a lump while the shaved ice is served in cups as it does not aggregate and tends to fall off or melt quickly. It only requires you to have two ingredients, syrup and some ice. You can get ice from the freezer of your to fridge at home and a sweet syrup of your desired flavor and color from your local store. Creativity is not limited at this point. To those who love a single flavor can have one their way whilst those daring and willing to try a cocktail can go ahead and make a rainbow of a snow cone using different colors and flavors. Always keep off the electrical wires as they could electrocute you when you tamper with them once plugged into the power socket. An important point to note, avoid handling the power cords with wet hands, make sure you dry them first. As a safety feature, the machine only runs the motor to produce the snow cones when pressed. Upon release, it shuts off. This eliminates the danger of leaving the machine on while you do not have your attention on the machine with your hands on the power button. The blades on the machine are also designed to pull in any ice placed on the container; therefore, there is no need for manual effort trying push in the ice cubes, which might risk your fingers being hurt. Therefore, refrain from any temptations to push in the ice cubes while the machine is running. Wipe all the syrup on the machine cabinet and dry off any water inside and out the machine. The best ways are by using a wet cloth and dried up with a dry cloth. Check and inspect the blades and dry them if wet. Clean the drip pan, ladle, and the snow scoop before putting it back to storage. You do not need to have stubborn syrup stains next time you pull out the machine for use. The machine will not start. Check if the power cord is properly plugged into the power socket and the socket is switched on. If the ice is of the recommended size, it could mean you have a chipped or blunt blade that cannot grind the ice well. You can inspect the blade and sharpen if any is required. This depends on the particular use of the snow cone machine. If you planning to commercialize the selling snow cones, you would need to opt for a high volume machine that can run virtually for a whole. For those who just need one for the household use, a smaller one can serve the purpose as the volume and operation time is not a major constraint. This majorly depends on the construction material of the machine. Some are made of plastic material while some have incorporated the use of stainless steel. It is understood that the one with stainless steel blades and parts will outlast the plastic counterpart by far. A snow one machine can either be manually operated or electrically operated. Manually operated machines are safe from one point of view, as they do not use electricity for their operations. However, they can be a bit slow and tedious to operate. On the other hand, the electrical is much more convenient and faster but pose the danger of an electrical shock id mishandled. This boils down to personal preferences. There a variety of designs available in the market, one can pick a certain design depending on whatever works for you or the kitchen décor. Depending on the manufacturer, each machine comes with its own accessories to use. Such include the scoops or replacement blades for use when the installed one is worn out. It is always good to go for the machine that comes with some of the accessories that may add to its durability and double its use or purpose of making other beverages making it versatile. If you pick a machine that runs on electrical power, the power consumption of the motor becomes a factor to consider. It is always advised to pick on a motor that balances on power consumption and work output too. It should consume the least amount of power while delivering more snow cones at the same time. Prevention is better than trying handling an accident later. Therefore, a good machine should come with some foolproof mechanism that is aimed to protect the user from harm whilst using the machine. Such include a safety button that will not start with the snow compartment lid is not covered to avoid the temptation of putting your fingers in the machine as it operates. This works extremely well especially when the kids are operating the machine on the own. The cost of the machine is a culmination of many individual factors including the above-stated points. The cost, however, does not necessarily indicate the suitability of the machine to ones need. It is therefore advised that you take your time comparing brands and their capabilities while weighing their suitability to be able to get the fairest price for the machine that serves the purpose right. 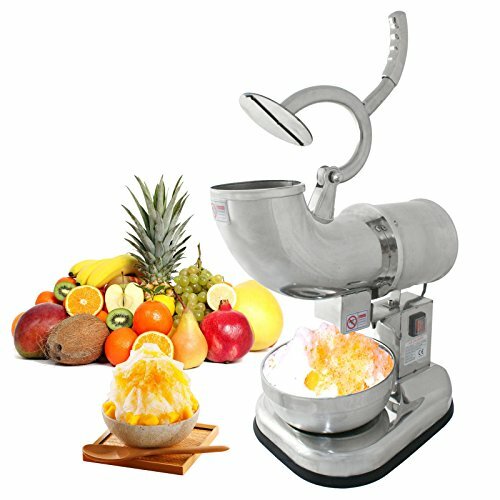 Below are some of the most asked questions about the snow cone machines include and their answers. Q: How much does the snow cone machine produce in an hour? This is dependent on the machine speed and capacity. It also depends on whether you operate the machine continuously for an hour or not. Q: How much ice do I need? A single cone can average about 5 oz. with simple calculations, you can calculate using the ratio of 5oz=141.75grams, you can get the exact amount of ice you would need. Q: How much syrup should I use to flavor each cone? This depends on personal taste, but for a commercially sound ratio, 5 oz. should take about 1-2 oz. or syrup. My personal pick would be the ZENY Electric Ice Shaver 300W as it features a great ergonomic design that is functional. It can also be used at small parties at home or can be used for large parties or at commercial spaces such as fast food restaurants, office or carnivals. It can comfortably service both worlds. It also is constructed of stainless steel, which makes durable and reliable too. To ice that up, it has a sleek and elegant design that intrigues me. It stands out even when placed on the kitchen counter.